Konami Gaming with jet another surprise for us, and it’s their best work so far. Meet African Diamond Slot, the game that explains the African soil, which is much different than what we had in mind. Lots of colours, beautiful nature and butterflies all over the screen, which will definitely change your perspective of Africa. 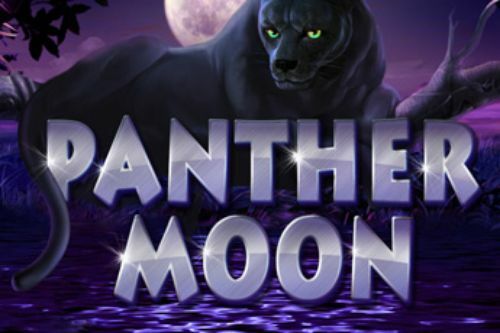 African Diamond Slot has five reels and 30 paylines, and the slot game has an RTP of 94.09%. The minimum betting amount in the game is £0.30, whereas the maximum wager cannot be more than £60.00. 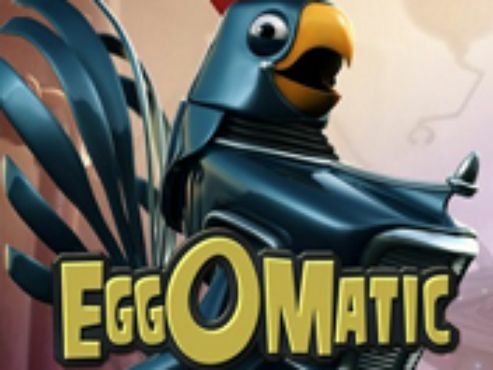 You can start playing the game as soon as you find an online casino which has the slot in their arsenal of slots. The game has a maximum payout of x1,000 your bet. The slot game offers you a chance to enjoy the African nature and all that’s connected to it but wait until you hear the music of the slot, which is what we loved the most about it. 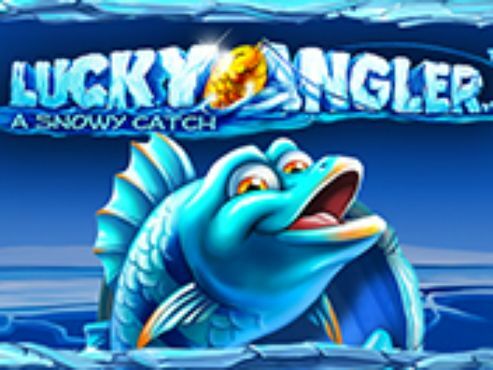 The fantastic design is the first thing you will see once you start playing the game, and the waterfall in the background makes every player enjoy the slot. The top of the screen is for the logo while on the sides, you can see the paylines. Try to mouse over them to see them on the screen and know what to expect. At the bottom of the screen, you can see the adjustable options and features of the slot, and you can set the denomination, coin value, level of the game and number of paylines. Here, you can also find the Auto Play and the Bet Max features, which are right next to the Spin button. 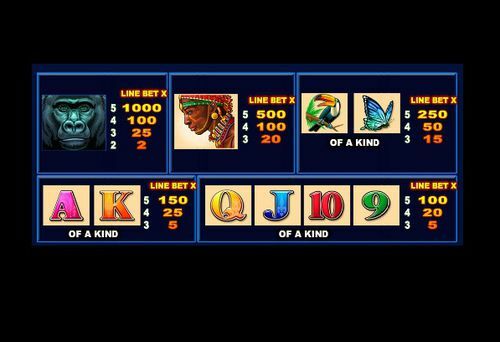 There are two categories of symbols in this slot, and they are divided into higher and lower valued ones. The lower valued ones are, as expected, the standard deck of card symbols. They are represented from the number 9 all the way up to the Ace. On the other hand, the higher valued symbols of the slot are represented by Native Africans, gorillas, birds, butterflies and interesting ornaments from that part of the Earth. 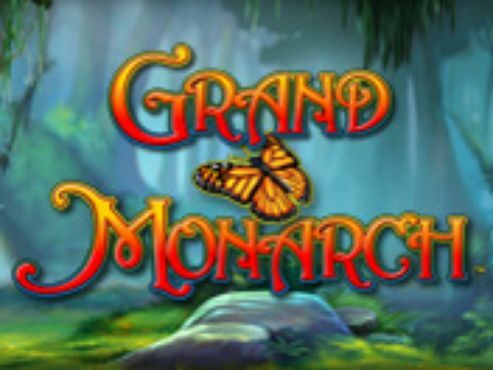 To start playing African Diamond Slot, you need to find a casino which has this five reeled 30 paylines online slot game in its arsenal of games. The casino is an important part of your gameplay as you will spend most of your time on the pages of the same, and it will be responsible for the deposits and withdrawals that you do. The casino will also hold your personal and banking information and they will offer unique welcome bonuses, customer support and a UI that will be on the screen while you play. Once that’s set, it’s time to set the denomination of the slot, which ranges from £0.30 all the way up to £60.00. 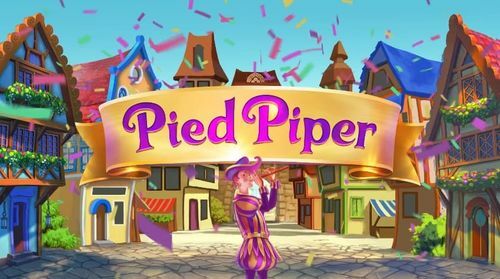 The RTP of the game is on a moderate 95.09% while the most that you can win from the game is a coin multiplier of x1,000! You can try some of the bonus features at the bottom of the screen like the Auto Play and Bet Max features, but we advise you to play them with care, as they can lose all of your money in the blink of an eye. 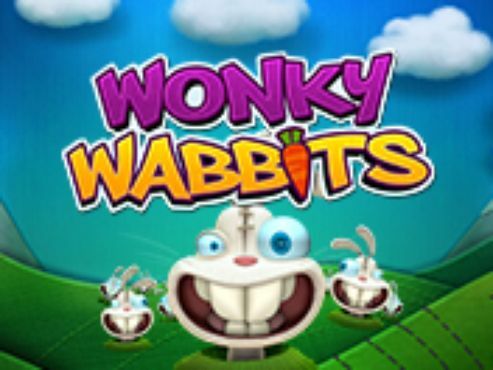 There is one bonus feature in the slot, and it’s the all-mighty free spins feature. 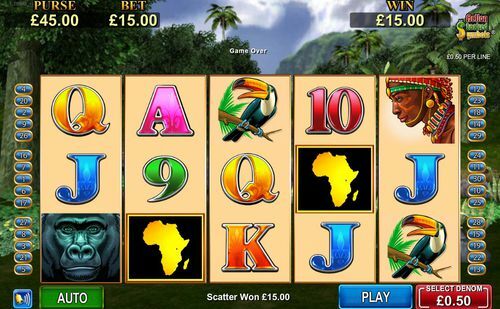 You can trigger it by landing three or more of the Africa symbols and you can win from 10 to 25 free spins, depending on the number of the Africa symbols that you manage to land on the screen. Everything that you win during this feature will be doubled, and you can re-trigger the feature while you are in it. Find a proper casino for the slot, make sure you deposit to get the welcome bonus and enjoy African Diamond Slot and all that it can offer.